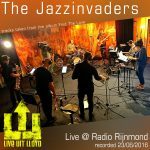 The Jazzinvaders visited Radio Rijnmond – Live Uit Lloyd on June 23rd 2016 to promote their 5th album ‘Find The Love’ and recorded several tracks taken from this album. Now the band is offering these recordings for free as they sound great. Thanks to Ronald van Oudheusden for having the band once more and Iwan Pronk for recording this session. To download these goodies, please visit www.socialbeats.com and be sure to check out the whole album as well! The EP can also be found at the Jazzinvaders Bandcamp page.